Finding yourself unable to drift off because it’s just too hot is frustrating. And being tired the next day isn’t the only consequence of a restless night. A sleep deficit renders you less empathic, more hazardous on the road and a candidate for Type 2 diabetes, cancer and depression, says Swedish psychologist and sleep expert Helena Kubicek Boye. Given that the ideal bedroom temperature conducive to sleep is between 60 and 67 degrees Fahrenheit (according to the National Sleep Foundation), it’s nearly impossible to create this environment sans air-conditioning, making shut-eye difficult to achieve. To this end, we’ve rounded up some tips from the experts to help you cool down and get some sleep (finally)! Sticking your sheets in a plastic bag and placing them in the freezer for a few minutes (try 10 to 20 minutes to start with; you don’t want crunchy sheets) will help cool you down quickly, says health coach and sleep expert Johann Callaghan. Cooling down your wrist and neck, will quickly help lower your body temperature, as blood vessels are closer to the surface of your skin. U.K.-based Neil Stanley, Ph.D., sleep expert and author of “How to Sleep Well,” recommends placing a damp cloth around your wrists or neck. Counterintuitive as it may seem, taking a warm shower is an effective way to make the heat more bearable, says Dr. Stanley. In fact, in a 2018 study published in the Journal of Strength and Conditioning Research, taking a hot bath helped runners acclimatize to the heat and perform better on their 5K. Even better than putting your sheets and pillow cases in the freezer is wetting them, says Boye. “Sleeping under damp sheets will cool you down even further.” Just make sure you have a plastic cover underneath to protect your mattress. “There is support for the hypothesis that the brain needs to be cooler to aid sleep,” says Dr. Browning. A 2018 study published in the journal Sleep showed that when a cooling device was placed on the forehead of 106 people, their sleep latency (time to fall asleep) was reduced, Browning says. Placing a cloth that’s been in the freezer (cold, not frozen) on your forehead will accelerate the cooling down of your brain, and sleep will cease to elude you. Steer clear of heavy, greasy meals before bedtime during the summer months, and have one less beer or glass of wine (or none at all), says Dr. Stanley. “You will need to burn calories if you don’t, thus producing more heat.” Alcohol also makes it more difficult to progress to REM sleep — the stage of sleep that’s restorative — says Callaghan. You might love the comfiness of your flannel sheets, but they aren’t doing you any favors in the summer. So opt for natural fibers like cotton — both for your bedding and pajamas. “They will wick away moisture and are fast drying so you don’t feel sticky,” says Dr. Stanley. She also cautions against the use of your mobile phone and computer close to bedtime. The blue light emitted from these inhibits the production of melatonin (the hormone that signals it’s time to nod off) and, along with the heat, will make it more difficult to sleep. To aid the process of falling asleep, it’s wise to keep screen time to a minimum as you’re winding down. For those who live in multiple-story homes, sleeping on the ground floor is advisable. The heat will rise and the lower floor will be cooler, says the National Sleep Foundation. Of if you have a finished basement, you might give sleeping there a try as well. 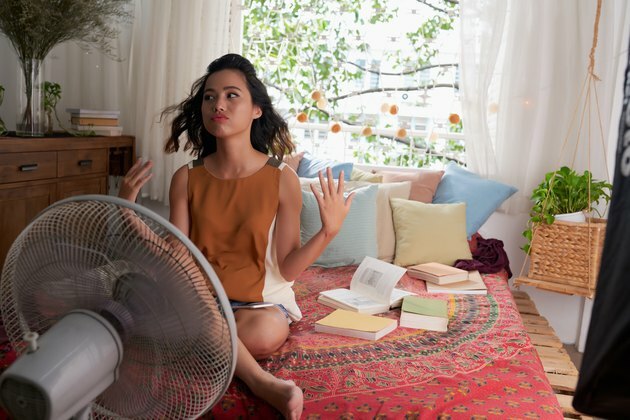 Should all else fail, using a fan is really the simplest way to keep cool — especially if you don’t mind the noise. For some, the white noise provided by a fan can actually facilitate sleep.